Gaspar, El Lugareño: (Miami) Mons. Wenski: "Key lime pie, Cuban coffee, oranges and grapefruits go to San Antonio if Heat loses"
(Miami) Mons. 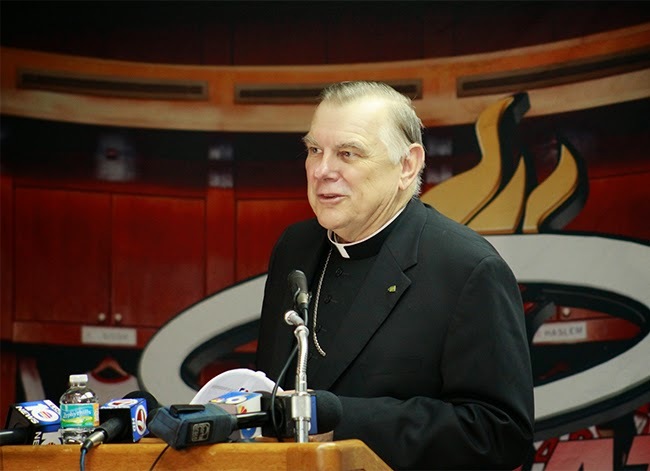 Wenski: "Key lime pie, Cuban coffee, oranges and grapefruits go to San Antonio if Heat loses"
MIAMI | As the NBA finals get underway, once again pitting the Miami Heat against the San Antonio Spurs, Archbishop Thomas Wenski has placed another friendly bet with his San Antonio counterpart, Archbishop Gustavo García-Siller. This year, should the Heat lose, Miami will send San Antonio some key lime pies from the southernmost point in the U.S., a supply of Cuban coffee and the “cafetera” in which to brew it, and a bushel of Florida oranges and grapefruit. The Archdiocese of Miami also will make a donation to San Antonio’s Catholic Charities.